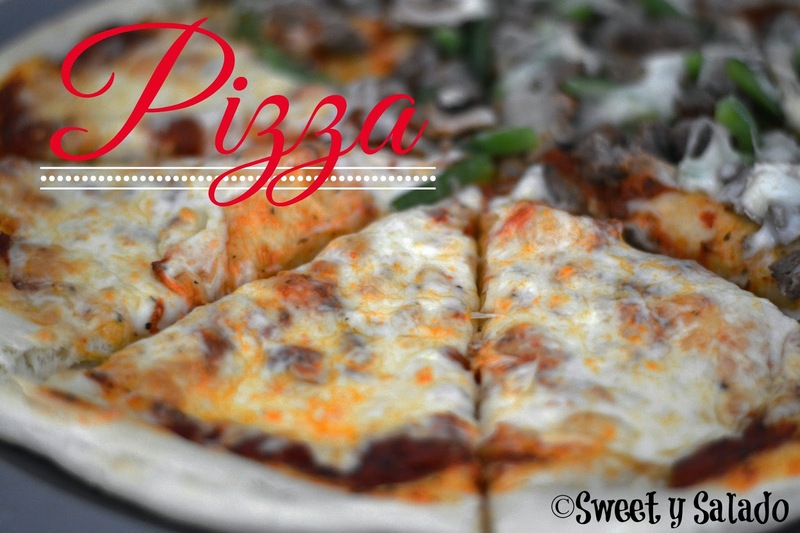 I promise that this is the last post I write about making pizza but I just had to do it so you could see how I make them at home. In previous posts I showed you how to make pizza dough and pizza sauce and now the final step is to shape the dough and add your favorite toppings. 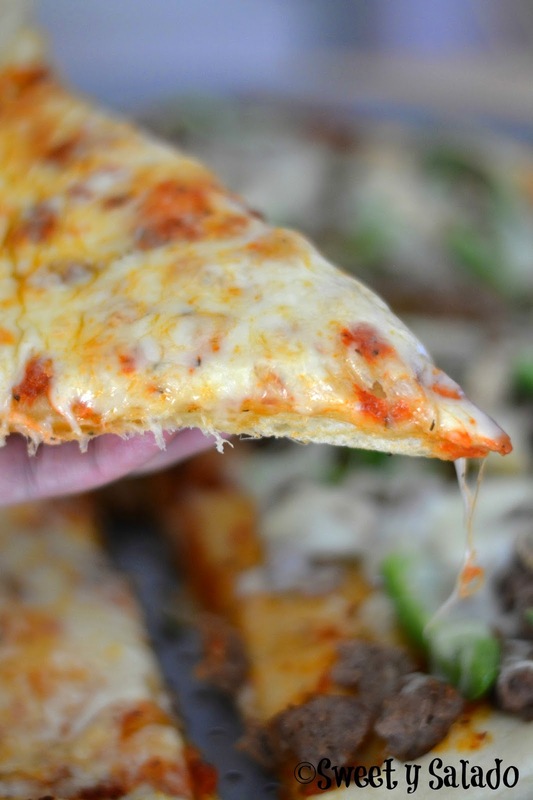 One of the most requested pizza recipes I get is how to make a “Colombian” Hawaiian pizza and even though it’s not a Colombian recipe, it is one of the most popular pizzas in Colombia. For this recipe I’m using a few meatballs I had left over from the spaghetti and meatballs recipe I posted a few weeks ago, some green peppers, mushrooms and mozzarella cheese, you can add whatever toppings you want like pineapple, ham, hamburger, pepperoni, chicken, onion, the options are endless. Shaping your dough is really simple and if you followed the steps I shared with you in one of my previous entries, you won’t have any issues with the texture. The more you stretch it, the thinner it will be and you can make the crust as thick or as thin as you want. Another thing I do every now and then is to brush it with a little bit of olive oil, salt and garlic and it gives it a phenomenal flavor. Pre-heat your oven at 425ºF (220ºC). Grease a 14 inch (35 cm) pizza pan with the olive oil. Place the pizza dough on a flat, floured surface and press down the edges to make your crust. You can make it as thick or as thin as you want. Press the center of the dough with your fingers and start stretching it to make a small disc. Place your hands under the dough, lift it and start stretching it with your knuckles, let the weight of the dough help you stretch it. Keep stretching until the dough is the size of your pan. If you see any small holes, you can pinch them closed with your fingers. Now, place the stretched dough on the greased pizza pan and add your pizza sauce. Place the meatballs, green peppers and mushrooms over half of the pizza since we won't be putting any toppings on the other half. Now, add the mozzarella cheese on the entire pizza and bake for 12-18 minutes or until the cheese has melted and the edges are golden brown. You can make it with the toppings that you want like pineapple, ham, sausage, chicken, onion, olives, etc. and add more or less cheese and sauce.